Everything before 1993 could be termed the Dark Age, a period shrouded in mystery, when there was no internet nor any dedicated PC gaming magazines, and when the "IBM compatible" was seen as just another home computer format among many (and as far as the UK was concerned, one that was both technically inferior to and several times more expensive than the riotously popular Commodore Amiga and Atari ST). Thanks to this combination of factors most modern gamers are unfamiliar with the PC's formative years, having only joined the party in the mid-1990s after sound cards and CD-ROM drives had become standard features and the likes of LucasArts, Origin, Bullfrog and Westwood had started churning out big-budget blockbusters. While these big-name studios played a role in the PC's reinvention, most of the credit for realising the PC's true potential as a games platform came from a very different scene. Our story begins in America in the mid-1980s, where the PC enjoyed rather more favourable conditions during its early life than in Europe. The Amiga and ST never really caught on in the States, and IBM PCs or fully-compatible clones (no shabby Amstrad 'word processors' over there) were cheap enough to make them a viable option as a home computer, although most were still situated in schools and offices. 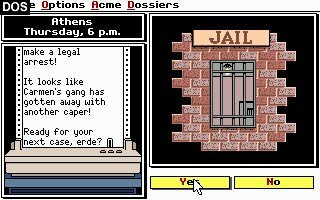 PCs were the tools of Serious Business, and so it followed that PC games should be executive toys (World Class Leaderboard), teaching aids (Where in the World is Carmen Sandiego?) or dorky IT department humour (Space Quest, Leisure Suit Larry). Minimum specs were dictated by the machines that players had access to in their downtime, with the idea of buying or upgrading a PC explicitly for the purpose of playing new games being the stuff of fantasy. Larry, a man of leisure. So what happened to transform the PC from the buttoned-down home of golf, chess and flight sims to the hotbed of creativity and innovation pumping out classic after classic from 1993 onward? Was it the inevitable result of technological progress? Only partially. Publishers seemed content at first to use the PC's expanding capabilities to simply make prettier golf, chess and flight sims. How could the complacent PC games industry be shaken out of its torpor? Such a task called for nothing less than a revolutionary movement - an underground development scene, answerable to no marketing departments and dismissive of hidebound conventions about what PC users would consider 'worthy' uses of their sacred beige monoliths. Their success would hinge on the creation of fast, fluid, immersive games that would thrust the PC into the limelight and make Amiga owners involuntarily hiss with envy. Games, in a nutshell, like Doom. That movement was known as Shareware.